A few tips on buying pet health insurance could save you a lot of money if your dog suddenly becomes ill or is injured. The cost of specialized veterinary care can be expensive, but a dog health insurance policy offers a way to ensure your pet will be able to receive the medical care he needs. Get a few quotes from insurance companies and compare their features. Decide whether you are more concerned with monthly cost or types of coverage offered. Keep in mind that paying a low premium also reduces the amount of insurance coverage. Speak with your veterinarian about the costs associated with treating the more common conditions for your dog's breed. The policy's waiting period - to prevent fraud, there is usually a waiting period between when you purchase a policy and when your coverage actually begins. Exclusions based on your dog's medical history and breed. If a policy's coverage doesn't include coverage for cancer, chronic diseases, hereditary and congenital diseases, and medical conditions that are common to your dog's breed, be prepared to buy additional coverage as an add-on. This type of plan covers basic health care needs caused by illness and accidental injuries. The premiums charged for this kind of plan are usually among the most affordable, but you'll wind up paying a higher deductible, and the amount of reimbursement may also be lower than a more advanced plan. Covers health care needs caused by illness and accidental injuries and offers policyholders a higher rate of reimbursement for their medical bills. A lower deductible is usually offset by a higher premium but choosing this type of plan means you'll have lower out-of-pocket expenses at the time service is required. This can be especially beneficial during an unexpected emergency. Riders are specific add-ons to a policy that provide extended care coverage and are available for an extra fee. Typical riders include extended coverage for cancer treatment, routine vaccination/heartworm prevention treatments, dental care, etc. Petplan is the world's largest pet insurance provider and is available in every state and the District of Columbia. Petplan currently has one of the highest customer ratings among pet insurance plans and is well regarded by vets as a plan that offers a fairly comprehensive base of coverage. Coverage for non-routine dental expenses is limited, and you may have a 20% co-pay depending on who your insurance policy is underwritten by. Embrace is an Ohio-based company that offers pet insurance in all 50 states and is noted especially for its flexibility in allowing you to choose any vet and even covering some alternative therapies. It's also customizable, allowing you to choose what you would and would not like covered. Buyers should know that if your pet has had cancer before your policy went into effect, a recurrence of any type of cancer will not be covered. Also, if you want prescription meds covered, that is an additional add-on and not part of the base coverage. Healthy Paws is known for being incredibly compassionate. Despite being a newer company, Healthy Paws still offers a generous payout, coverage for some pre-existing conditions, and coverage for chronic diseases and conditions. Customers should note that the insurance does not cover exam fees for diagnosing an illness or injury (but does cover treatment.) In addition, pet lovers might feel good knowing that when you insure your pet through Healthy Paws, a portion of the money they make goes to the Healthy Paws Foundation - which donates money to shelters. 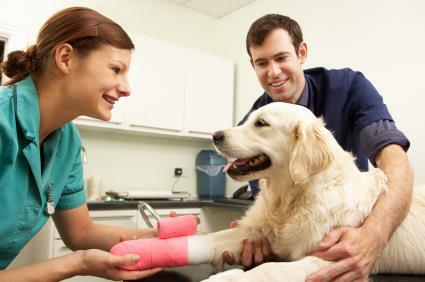 Your veterinarian may also be able to recommend reputable agencies he/she has had experience with, and you can check out agencies through your local Better Business Bureau. Having pet insurance could extend your dog's life. With many veterinarians performing state-of-the-art treatments, pets now have better medical care available to them, some of which could be covered by an insurance policy. A medical emergency won't automatically drain your bank account. You have peace of mind knowing that you are prepared in case your dog has a chronic illness or accident. You take your chances knowing that you could spend a considerable amount of money in insurance premiums and your pet may never develop a serious condition. Insurance policy costs vary. The type of injury or illness, your dog's breed, age, medical history, and where you live affect how much you pay to have your dog insured. Many policies don't cover pre-existing or hereditary conditions. One way to decide whether a policy is right for you is to think about whether it would be easier for you to handle a big expense should one arise, or if it would be easier to handle ongoing payments in the form of premiums. A health insurance policy for your pet is only as good as the coverage it provides, so be certain you understand exactly what you'll be getting for your money. Comparison shop before you settle on a specific company or policy and take the time to check the background of any agency you consider doing business with.